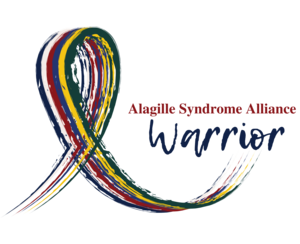 The Alagille Syndrome Alliance has launched its first ever awareness ribbon in support of the Alagille syndrome (ALGS) community! The multi-colored awareness ribbon is meant to represent the complex and uniquely varying severity of the disease throughout the ALGS community. Alagille syndrome is a rare genetic disorder that affects multiple organ systems in the body, including the liver, heart, skeleton, eyes, and kidneys. However, the specific symptoms associated with these organ systems vary greatly from person to person, even within the same family. To read more about Alagille syndrome, including symptoms and causes – click here! So because ALGS affects so many different organs, the ribbon was conceived as a way to represent the different ways this rare disease affects people. It is our hope that we can unite, relate and empower everyone dealing with ALGS, either mild or severe, and bring together those with significant organ representation who may not focus on ALGS as a whole but rather the organ system most affected. WHO ARE THE ALAGILLE SYNDROME ALLIANCE? This non-profit org strives to support the ALGS community through innovative efforts that emphasize education, opportunities to connect, access to resources, and individual support. They provide resources, organize symposiums, collaborate with medical professionals, and more! Each stands alone as a representation of symptoms and effects each individual diagnosed faces – and together it represents the unity of a community who is mobilizing and fighting for awareness and treatment. So please share this with anyone who might need it! And check out the organization on Facebook! Copied from Patient Worthy. You can see the original article HERE.